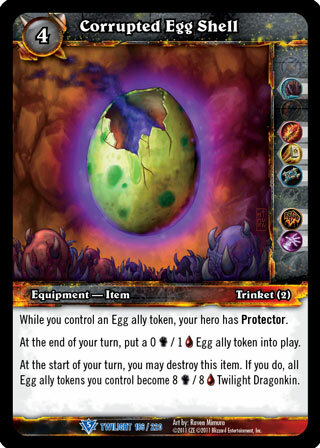 Rules: While you control an Egg ally token, your hero has Protector. ;At the end of your turn, put a 0 [Shadow] / 1 [Health] Egg ally token into play. ;At the start of your turn, you may destroy this item. If you do, all Egg ally tokens you control become 8 [Shadow] / 8 [Health] Twilight Dragonkin.